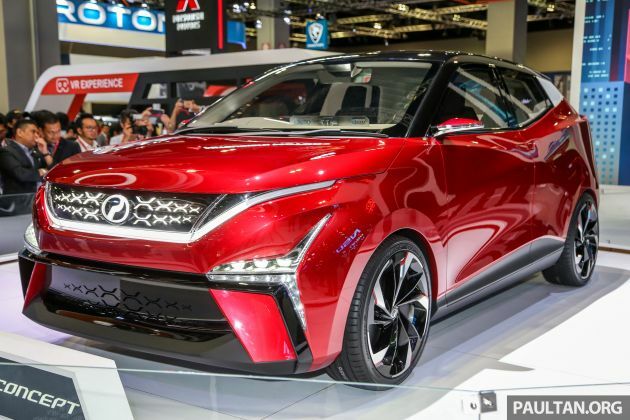 Perodua has unveiled the X-Concept, its headlining display at the KL International Motor Show (KLIMS) 2018. Billed as “The Perodua of Tomorrow” the showcar touts connectivity, besides showing off a neat and futuristic design. The five-door hatchback is roughly the size of today’s Myvi, but appears slightly longer and lower. Perodua says that it’s spacious enough to accommodate day-to-day activities, but compact enough to manoeuvre in dense urban spaces. It does look SUV-ish, and is the “X” in the name hinting at a small crossover? P2 says that the “X” stands for stability, dynamism and advanced technology, though. The X-Concept wears typical showcar jewellery such as suicide doors, huge wheels, tiny wing mirrors and flush door handles. It comes in red-black two-tone paint, and the C-pillars are painted white for a floating roof effect. The side profile is more sculpted than your usual Perodua, and is slightly pinched in the middle. The front end has a dominant “X” theme, and the main design protagonists are the low-set LED headlamps – which are incorporated into oversized “side intakes” – and the full-width grille, which sport a big P2 emblem and an “X” motif. The latter repeats the X-Concept’s model logo. Perodua says that the showcar fuses sharp angles with “subtle design elements”. The connectivity part is explained as having things like maps, e-mails, appointments and weather or flight times available to the driver. The dashboard is built on the “rolling tablet” concept. iPad? Yes indeed – the iPad Pro is there for a generation of motorists “accustomed to tapping and swiping,” Perodua says. Neater and more mature than P2’s previous concept efforts, we think. Like what you see? How u know better than x70? Because it’s not a Proton and not china car. In another words, already confirmed X70 is surely much better than this junk. my family NEW myvi quality is very lousy. panels and suspension goes kin-kin kwang-kwang over minor road irregularities. previous myvi is much better in this aspect. so much for toyota perodua quality. Go replace the spring. 1st batch of myvi got spring problem & fitment of usb socket. 2nd & 3 rarely got only the first. The only concept car that going to become reality, which I have waiting for is the MAZDA KAI!!!!!!. But Bermaz sales personnel mentioned to me it will only arrive at our shores in 2020. And with that engine, Euro 4M only cukup2 makan. You need Euro 6 at least to feel the power. Copy Lexus crying design. Why can’t they ever design a decent body? Is that the effects of 26 years only rebadging cars? Whats the point of building concept car for a company that just doing car re-badge? The probability of P2 releasing it is higher than P1 with their 5 models showcased in the past klims. Of course they can release faster. They didn’t have to develop anything except where to put their badges, and they didn’t have to do any endurance, reliability or road test. They just reskin a Toyota and sell them. But what’s there to be so proud about? Concept, concept and concept. Until now only rebadge, rebadge and rebadge. A lot of comment here is typical old fashioned malaysian. Bash, bash, and bash. Perodua showcase concept, you guys bash. Perodua rebadge car, you guys bash. Perodua design their own car you guys bash. What do you want exactly? Lowered down honda and toyota price so that you guys able to buy one? Typical junk worshippers. If Toyota & Honda are junk, then Peroduas are worse than junk. Strange is it not? its anak tempatan’s car creation. if youre too good, go design your own carlah. Lovely design, as good as Chinese cars. what is suicide doors? open the door will die is it? OMG! AS LONG AS IT IS FROM PERODUA, CONFIRM LAKU! MOST MALAYSIAN WILL GET AS IT IS THE “CHEAPEST”! WE LOVE MORE PLASTICS! WE LOVE SUB PAR FEATURES! OMG OMG! OTHER BRAND REBADGE SURE NOT GOOD, ONLY PERODUA REBADGE GOOD! PROVEN ONLY IN MALAYSIA! WOOOHOOOO! I think they re-build wide axia in this concept. Although it try to “sepet” front headlamp or “futuristikkan” vehicle bum, to me the front look like mitsubishi and the back look like cx3. To the driver of Myvi WB5336R, I have photo of you and your red Myvi. You were running red lights near KLCC on 24/nov 1.10 pm. Too bad i dont have a video of your despicable action. You are such a moron! All the other vehicles in other lanes have stopped. Yet you still sped up. What happened to your peabrain! You butthurt your car was too slow? Next time buy Myvi, it can fly! 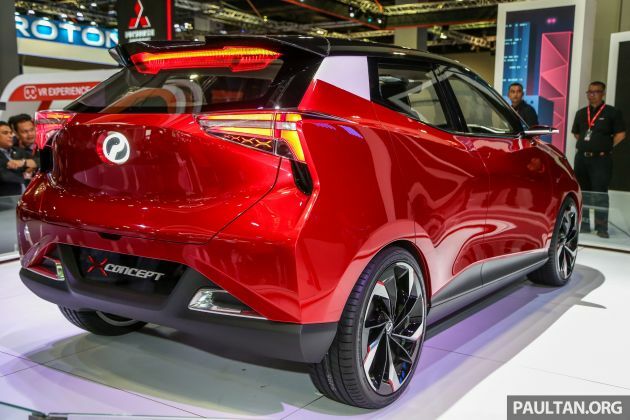 HOW MUCH IS THE NEW PERODUA X CONCEPT OTR? i still remember how the bezza concept design compare to the production design…very different. Waste of time and resources to create another pointless design which serve its purpose as only a “concept” car, not the actual car that we can buy tomorrow. Concept car is nothing more than just a rubbish car. Next time, try create a real purposefully concept car that we can see now, we can buy it tomorrow, period.